Osgood Schlatters Disease is a common cause of knee pain, particularly in adolescents. It is caused by inflammation at the top of the shin bone just below the kneecap and often follows a growth spurt. It is usually aggravated by tightness and weakness in the knee muscles. With the right treatment, it can settle in a few weeks. Without correct treatment, the problem can last a number of months. Carrying out a combination of simple stretching and strengthening exercises can drastically reduce the symptoms of Osgood Schlatters and improve healing time. Here, we will start here by looking at stretching exercises, and then go on to strengthening exercises. To find out more about the causes, symptoms and other treatment options available, visit the Osgood Schlatters overview. Tight quads muscles (found at the front of the thigh) are a common feature of Osgood Schlatters Disease. Osgood Schlatters usually develops after a sudden growth spurt, where the quads muscles can’t keep up with the growth of the knee bones. The quads end up being very tight causing a lot of tension where they attach just under the kneecap resulting in Osgood Schlatters. Complete rest from any aggravating factors for approximately one week is essential with Osgood Schlatters disease. After that, you need to start doing strengthening and stretching exercises to help reduce pain and further damage and allow the bone to heal. For simple tests to see if stretches would help relieve your pain, visit the knee stretches section. There are a number of different ways of stretching the Quads Muscles. Here are my two favourites, those that I find give the best results and that are the easiest perform. Action: Bring your heel towards your bottom pulling at the ankle until you feel a stretch in the front of your thigh. Hold for 30 secs. To get the best results from these stretches for osgood schlatters disease, remember this. Stretching effectively should be uncomfortable when you do it, but only in the muscle being stretched and the pain should stop as soon as you stop stretching. 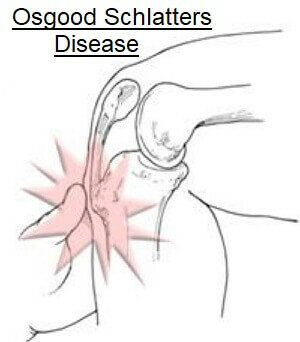 Stretching should never aggravate your Osgood Schlatters Disease. With each exercise, you want to feel the stretch in the middle of the thigh, not at the knee. For more tips on the best ways to stretch, including the latest research on how to get the best results with the minimum input, see the knee stretches guide. The next step is to work on strengthening the knee muscles. Go to the strengthening exercises for Osgood Schlatters disease section to find out how to strengthen the right knee muscles to make a full and quick recovery. 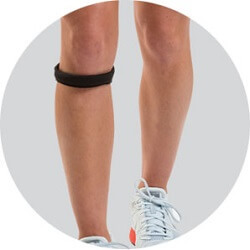 Something else that can really help with Osgood Schlatters is to wear a knee strap. It is a specially designed simple knee brace that places pressure through the patellar tendon reducing the friction and tension on it. Visit the knee straps section to find out more and read user reviews - people really do find that they make the world of difference. If you want to know more about Osgood Schlatters Disease including more information on its causes, presentation and other treatment options, go to the overview page.